Curb Appeal attraction starts with a well planned and executed landscape design which can define the entire look and feel of your property. From custom hardscapes to unique lighting techniques, it’s the design that brings everything together. Fortunately, the landscape designers at O’Grady’s Landscape have extensive experience creating thoughtful and creative designs that meet our clients’ style goals as well as their budget requirements. We are ready to collaborate with you! When you choose us for landscape designs in Sterling VA, we’ll work closely with you to create a custom design that reflects your sense of style and maximizes functionality. So if you’re ready to see the difference our custom landscape designs can make to your home, request a consultation today or call us at 703-533-5001! Whether you want an outdoor living space master plan for your backyard, a hardscape design, or an outdoor lighting design, O’Grady’s Landscape is the Sterling VA landscape company to call. Our landscape designers pay careful attention to each detail to help you accomplish your goals on schedule and within your budget requirements. What’s more, we have a large selection of materials to help you customize your design to meet all your needs and more. The design process typically begins with an initial consultation, which we’ll schedule as soon as possible. During this time, you’ll have the opportunity to discuss your ideas with one of our experienced landscape designers, who will assess your space and tell you what’s feasible and what’s not. We’ll then offer recommendations to help you make the most of your space and provide a design and estimate within a week that’s based on the decisions we’ve made together. We make it easy, yet comprehensive. 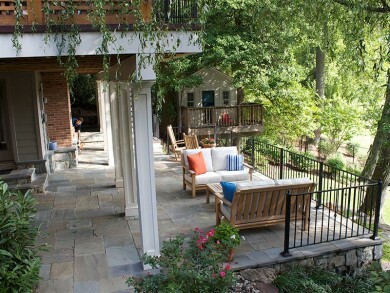 O’Grady’s Landscape is a full-service landscape company serving Sterling VA. Established in 1991, we provide a range of design, build, and maintenance services for residential properties in the area. By offering a wide variety of services, excellent project management, and timely customer support, we serve as a one-stop-shop for all of your landscaping needs.